OK, maybe I missed it, but I cannot find a stamp showing just Tenzing Norgay, without Hillary. I need it for an exhibit and I'm stumped. Does anyone know if there is a stamp showing just Tenzing? 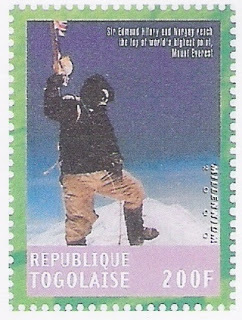 Yes, there is a stamp showing just Tenzing Norgay. This famous photo was taken by Edmund Hillary. I guess it is not difficult to buy this modern stamp. Good luck! OK, I've been watching ebay since you pointed out this stamp and haven't seen it yet. Since topical collecting is new to me, do you have any recommendations for a good topical dealer? “Tenzing Norgay stamp” or something like this. Maybe other collectors have better ideas to find topical stamps.